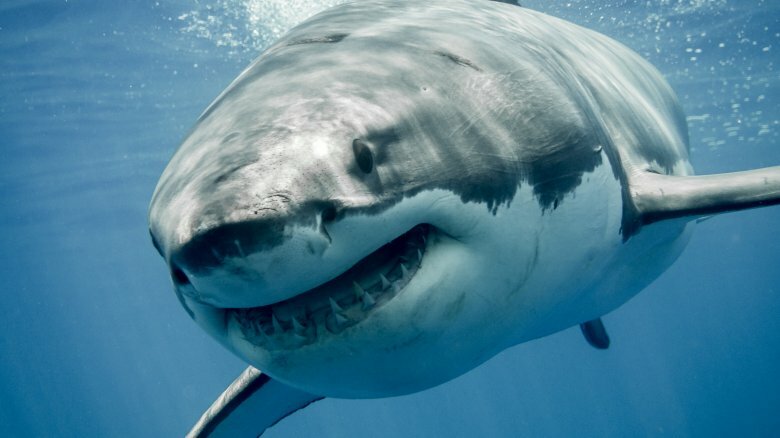 It's almost impossible to read the words "great white" without instantly hearing the Jaws theme in your head –- or that song "Once Bitten Twice Shy" by the famous 1980s hair metal band, Great White, but definitely one of the two. Here we're talking about the razor-toothed sea beast whose dorsal fin spells doom in Steven Spielberg movies: the great white shark. But not just any great white. We're talking about the greatest great white shark ever recorded. Equipped with up to 300 flesh-rending teeth, a super-strong sense of smell, and special organs geared to detect the electromagnetic fields of other animals, great whites are the world's biggest predatory fish, per National Geographic. You could call them the lions of the sea, but they eat sea lions for breakfast. The average great white shark is 15 feet long, making it twice the size of your worst nightmare. The largest ever caught on film is about 20 feet long and weighs an estimated 5,000 pounds. People call her "Deep Blue," and she was first introduced to the public through Discovery Channel's Shark Week marathon. Despite her prodigious size, the way-too-many teeth in her mouth, and those freakishly beady eyes that seem to know precisely how you taste, Deep Blue is not a nightmare. In fact, most great whites aren't. Even though they account for one-third to one-half of the more than 100 shark attacks that happen each year, great whites apparently bite people out of curiosity rather than bloodlust most of the time, and most chomping incidents aren't fatal. So rather than seeing Deep Blue as the 20 feet of terror fuel she looks like, we can think of her as 12 adorable human babies stacked end to end who explore the world by tasting it with their dangerously serrated mouths. Deep Blue, however, is not a baby. She is a roughly 50-year-old shark who can literally hug you to bits with her mouth. So you probably wouldn't want to get too friendly with her if ever you crossed paths. Yet when 50-year-old behemoth Deep Blue was first discovered near the Mexican island of Guadalupe in 2013, one diver felt so comfortable that he reached out and touched her. That someone was shark-ologist Mauricio Hoyos Padilla, who gave Deep Blue her nickname. In a video clip of their encounter first released in 2015, a fearless Padilla "high-fived" one of Deep Blue's fins. Cool, yeah, who really needs both of their hands? Even if you don't mind the prospect of an underwater amputation, high-fiving a great white is a terrible idea because it can also endanger the shark in some cases. When a group of divers touched a different great white from inside a cage in 2016, one biologist called it "one of the dumbest and most dangerous shark interactions I have ever seen" because in addition to endangering the divers, it could have prompted the shark to ram the cage and injure itself. In fairness to Padilla, he might have just been overcome with excitement. It's not every day that you get to see a female great white up close. As a shark expert explained to NBC, "Females are kind of elusive. We haven't really figured out where they go or how they spend their time." However, Padilla had an idea about how Deep Blue spent at least some of her time. He thought the gargantuan fish was pregnant. So maybe the high-five was his way of saying congratulations. But not everyone thought Deep Blue had a bun in her oven. Shark expert George Burgess told ABC, "The only thing I take umbrage to is that she was pregnant — I'm not sure that she was from what I could see." It's not clear why anyone would "take umbrage" at the thought of someone mistakenly thinking a shark is pregnant. Perhaps Burgess thought Padilla was subtly trying to fat-shame the fish. Maybe Padilla should have just said she's big-boned, or since she's a shark, big-cartilaged. Or we could just go with Burgess' description: "She's a big girl." But maybe she's not as big as people say. Burgess, who directs the Florida Natural History Museum's International Shark Attack File, estimated that Deep Blue is closer to 18 or 19 feet long. That might seem nitpicky when you're discussing an animal that can bite off your feet altogether, but it makes a huge difference when measuring the largest animal of its kind. Deep Blue should really settle things by agreeing to be tape-measured. Or, since sharks need their space, we can just be content knowing that the ocean is full of roughly bus-sized creatures that can eat you.